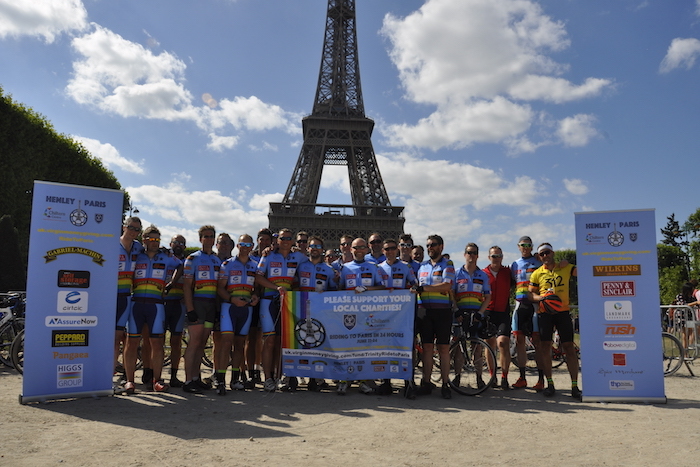 It was the moment of truth for the Trinity to Paris Cycle team as their months of training were put to the test last weekend. 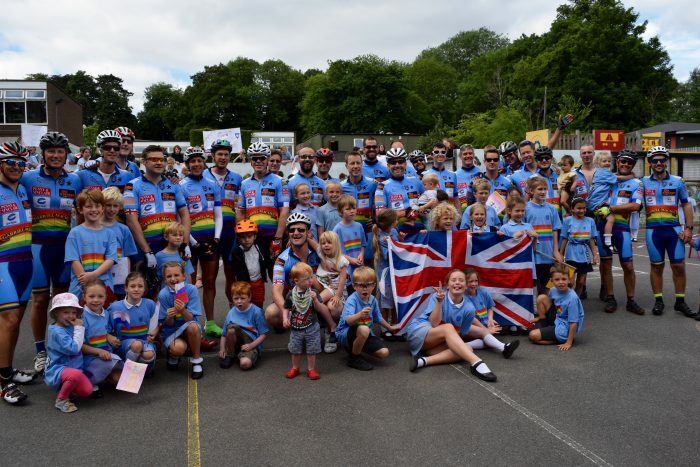 The 201.95 mile journey from Trinity School to the Eiffel Tower was tackled by a team of 32 riders in the space of 24 hours, all in aid of Trinity Primary School and The Chiltern Centre for Disabled Children. Tensions were high as the group made their way to the school grounds on Friday morning. With the challenge they faced finally upon them, there were many confessions of nervousness, although some tentative excitement too. “I think when we get going it’ll be fine, but it’s like all things — it’s the waiting around that’s nerve-wracking” explained Nicki Aitken, the only female member of the team. 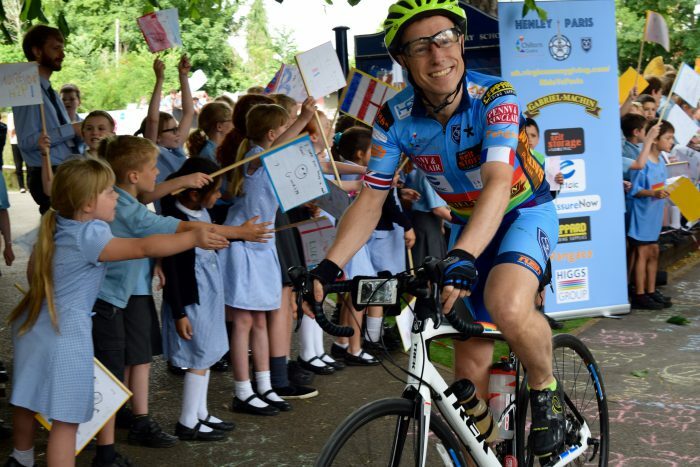 Spurring the brave cyclists on, the entire school came out to cheer, waving banners, flags and posters as they chanted “Henley to Paris”. 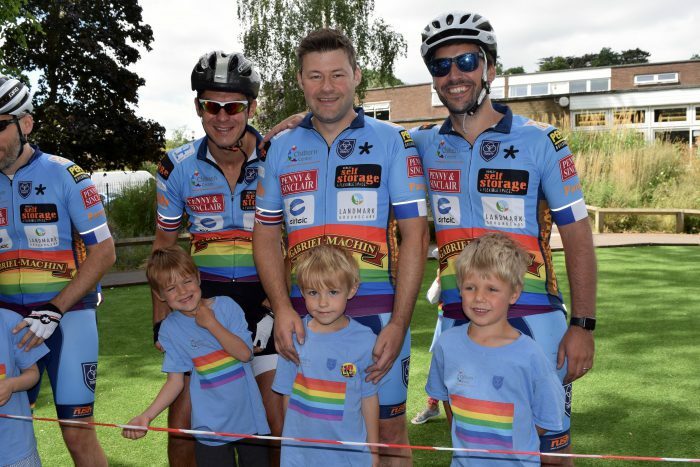 The athletes were also seen off by the staff, Reverend Duncan Carter, Liz Deacon of The Chiltern Centre, Mayor Kellie Hinton and Councillor David Eggleton. There were speeches to mark the occasion, with a host of names mentioned in thanks. 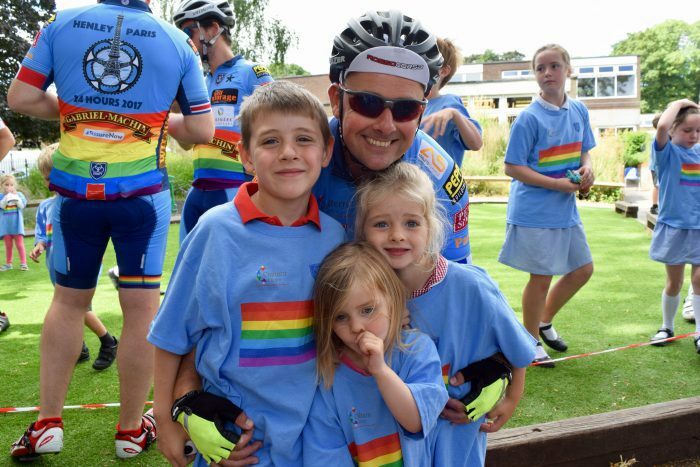 Tom Potter, who organised the ride, expressed his gratitude to the many sponsors and supporters, and the fantastic charities that the proceeds will be going to. Liz Deacon, in turn, gave her thanks for all their efforts in fundraising, before Reverend Carter led the crowd in a prayer for a safe and enjoyable trip. 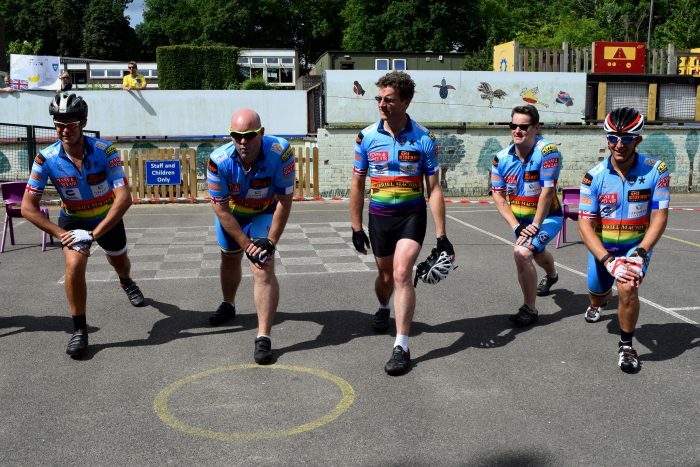 When the time came to push off, Thames Valley Police offered their support by safely escorting the riders from the playground to Wargrave Road. Thus began the taxing expedition, during which the cyclists spent between 12 and 14.5 hours in the saddle. Their combined mileage was 6,462.4 miles — the equivalent of the distance between London and Singapore! 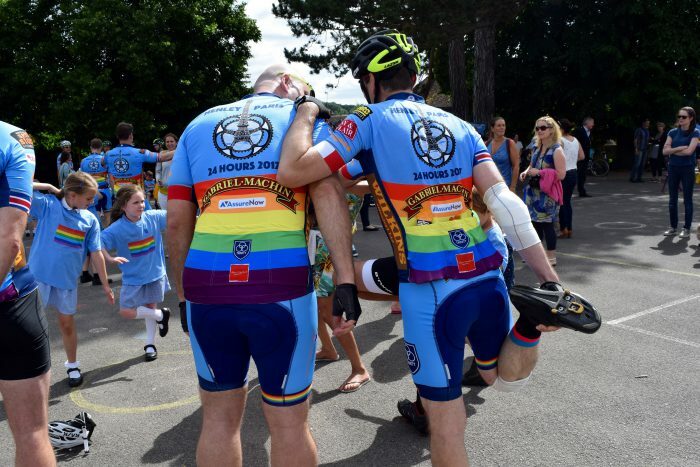 Together, they burned over 320,000 calories, so were incredibly thankful to both Tesco’s Henley and Mrs Minn’s Vintage for providing sustenance. 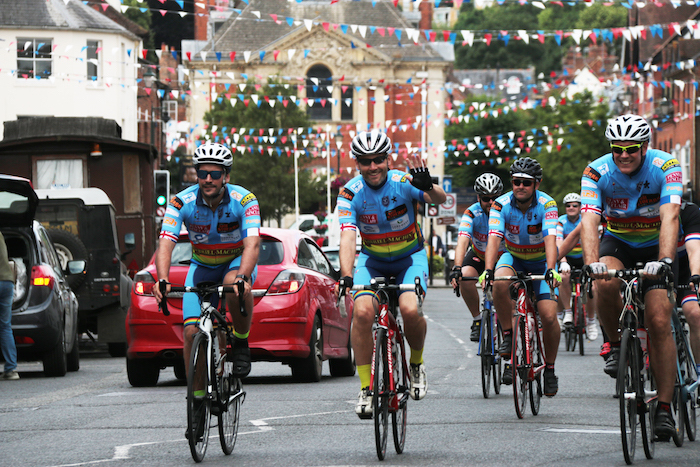 Tesco’s donated 120 bananas and water to help fuel and hydrate the tandem, whilst Jo McGinn and the team at Mrs Minn’s Vintage baked brownies and flapjack. 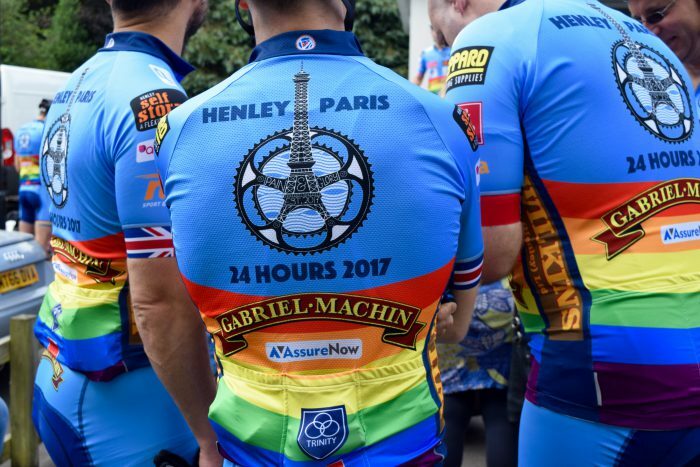 The local sponsors printed on the riders’ kit were Gabriel Machin, Wilkins (Henley), Penny & Sinclair, Henley Self Storage, Landmark Groundcare, Peppard Building Supplies, Spice Merchant, Rush Sport & Entertainment, Henley Practice, JenKat Digital, Pangaea Creative, Above Digital, and Athlete Service. Additional generous support came from Eirteic and AssureNow. 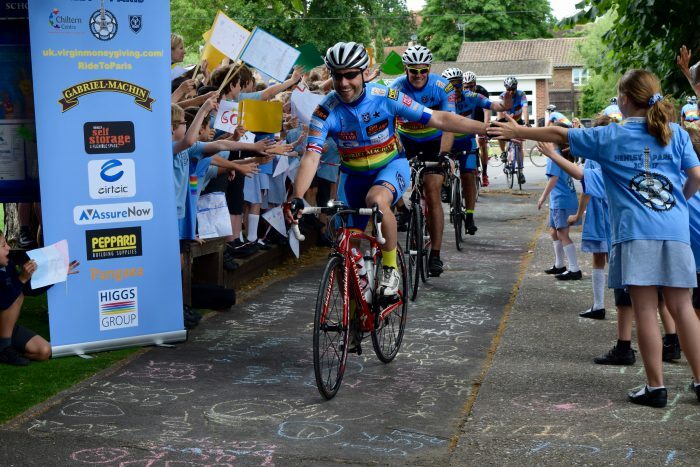 The Trinity Fun Ride is still collecting donations — please show your support by contributing at http://henley2paris.bike.